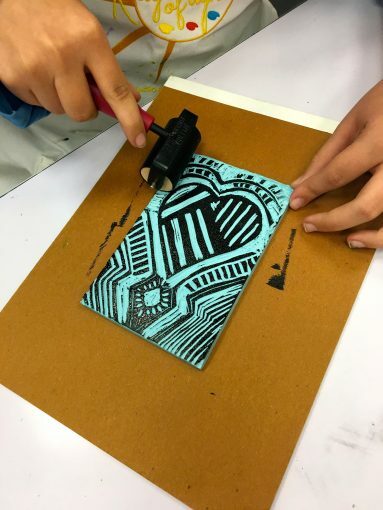 Some of you many remember block printing from your middle school or high school art class — and not in a fond way. 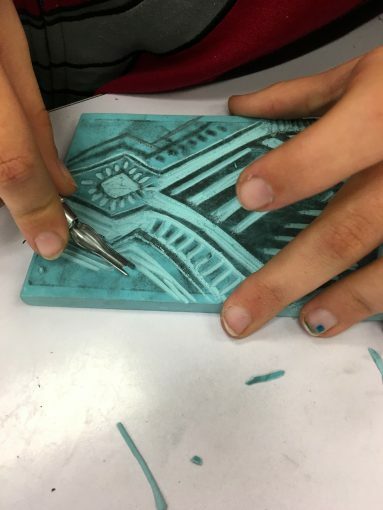 I still hear horror stories from clients that remember trying to carve into hard, brittle linoleum blocks and trying not to stab themselves, all while trying to make something artistic in the process. Well, my friends, those days are gone! Speedball and companies like Moo Carve have created the “soft block”. This new material is thicker, softer and allows for intricate and detailed carving all while saving your poor fingers from injury. The soft block allows you to carve with ease and focus on your design instead of fearing it. 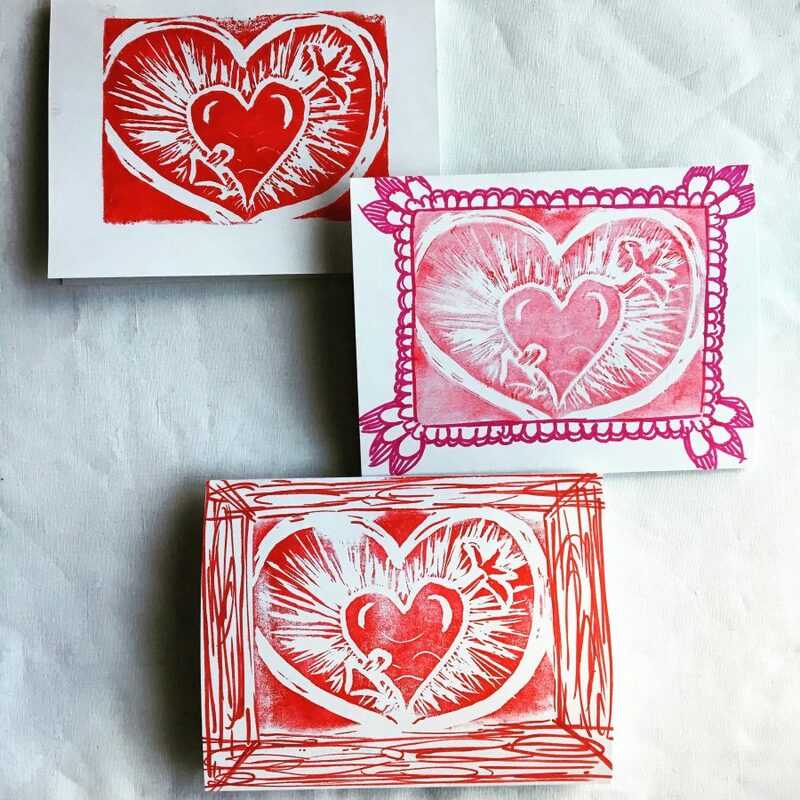 February is a great time to reignite your love for block printing, by making you Valentine’s cards! The block printing process allows for the printing of multiple copies of the exact image which makes it a great choice for your Valentine’s cards. You can even print the same image and embellish it with markers making slight variations to the same design. 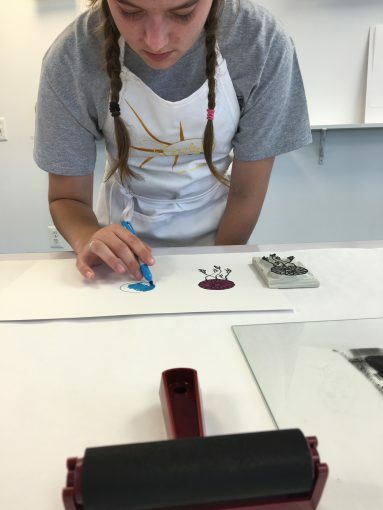 You can even get your little ones in on the fun, by having them help with the printing process or by having them embellish the prints. Each card can be different and as special as the person it’s intended for. After drawing the image onto paper, simply rub the ebony pencil on the back of your design, making a carbon or graphite back. It can easily be transferred to the block by drawing over the design again. Carve out your design and then you are ready to apply the ink to the carved design. The process is trail and error until you get the feel for the brayer and ink. Then carefully turn over the inked block and press firmly and/or massage the block to transfer the ink to the cardstock. 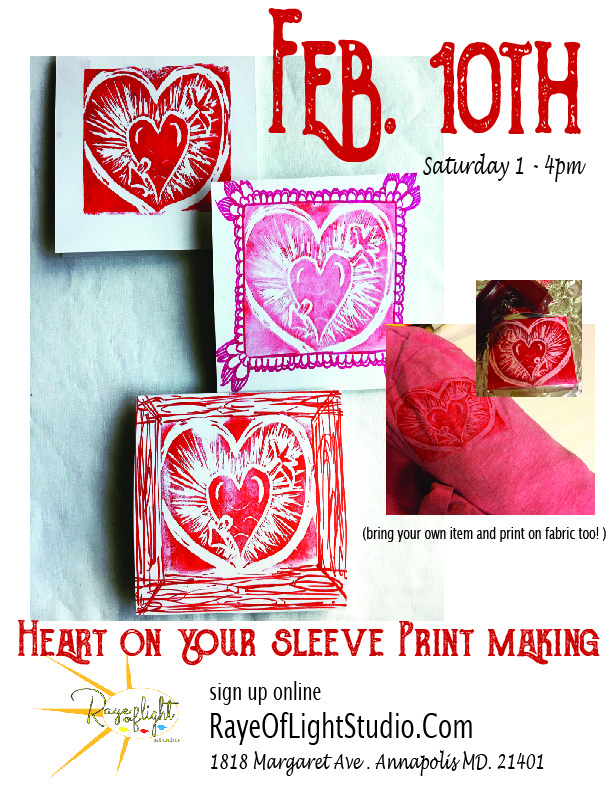 If you have a change of heart and would like to take a class on block printing first, please come see me on Saturday, February 10th. Use this link to learn more about the class and to sign up yourself or with your family. Once you learn this skill/art form you will want to personalize every paper surface and tee shirt you own!